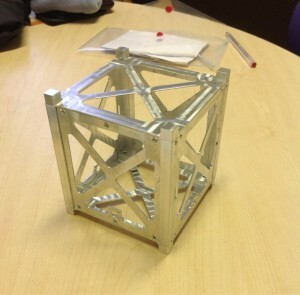 A key part of Project BLAST has been the manufacture of the cubesat itself. With modern manufacture techniques, producing metal parts can appear to be as simple as putting a block of metal on a CNC milling machine, uploading a CAD drawing to it and pushing ‘go’. In reality, there is a lot more to it. In this week’s technical corner, I’ll be illustrating the process by walking you through the manufacture of some of the BLAST cubesat parts. Computer-aided design has revolutionised engineering; the ability to 3D model components and assemble them in virtual space is enormously powerful. The image below shows the model of the cubesat we produced. Once the model has been completed and the team are satisfied that the design fulfils the requirements, the process of producing technical 2D drawings begins. Known in the trade as ‘detailing’, putting dimensions on a drawing of the parts is arguably an art form. There are many considerations that need to be taken into account. What are the key sizes? How should the dimensions be laid out? Most importantly, how can the design be clearly conveyed to the reader? Tolerances are important when detailing – it is nearly impossible to mill precisely to a given dimension so all drawings will have a tolerance indicated for dimensions. In the BLAST drawings, a dimension given to one decimal place has a tolerance of +- 0.2 mm, two decimal places +-0.1 mm. 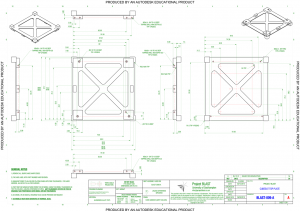 Special tolerances are detailed on the dimensions to which they relate. The capability of the manufacturing process must be considered when setting these tolerances: a mill can achieve +-0.1 mm comfortably, and up to +-0.02 mm on a good day or within a single operation. In the case of the cubesat, the outside rails have to fit into the p-pod style integration plate. Even if you can achieve having two mating parts both exactly 100 mm wide, they will not fit together. For a nice sliding fit, a difference of around 50-80 microns (0.05-0.08 mm) is ideal. To produce this fit, the worst-case combinations of the tolerances on the dimensions must be considered – this is called ‘maximum metal condition’. Two example drawings from the BLAST cubesat are shown below – for the base and one of the side plates. You can probably spot the mating tolerances on these drawings. Before the machining can be started, the machinist must look at the part they are about to make and decide the best way to approach it, taking into consideration the tolerances and, critically, how to hold the item during the machining process – you don’t want to be machining the vice itself! Often, the use of fixtures to hold the item is required, and Project BLAST is no exception. Additionally, the choice of tooling is important. Small tools may be needed for tight corners but snap easily, while large flat tools are used to cut larger areas but often cause large vibration. The sides, top and base of the cubesat have some very thin sections, as thin as 1 mm in places. There is the potential for these thin areas to resonate during the machining process – a vibration of 50 microns is enough to severely damage the finish. By using a combination of smart tool choices and some well thought out fixtures this can been prevented. 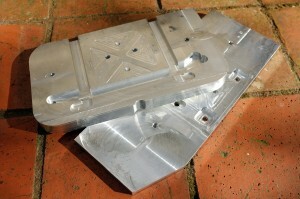 The image below shows the two fixtures used to produce the base, top and two of the side plates. They have been manufactured out of 6028 aluminium alloy. Once and approach has been determined and the tooling selected, the actual milling operations must be designed and programmed. 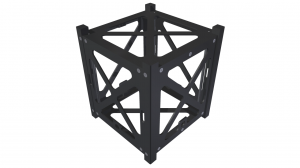 This is done using computer-aided manufacture (CAM) software; in the case of Project BLAST, we used Planit AlphaCAM software. The video below shows the simulation that this software produces to help the machinist check their design. Once programmed, the program can be uploaded into the machine ready to start machining. There may be several operations in the manufacturing process and each will have its own program. The setup isn’t over yet. Now the tools required must be loaded into the machine, and the machine must be told where the material to be machined actually is on the bed of the machine in all three dimensions. Now the ‘go’ button can be pressed, but with caution. All CNC machines have a ‘single block’ mode that allows the machinist to proceed with the machining a step at a time and watch for potential errors, such as an undefined tool height or poor datum set. They will also be making sure that the tools will not collide with clamps if they or other fixing methods are in use. The videos below show the machining in progress. After a few tens of machining hours, the cubesat structure is complete! More importantly, it fits together! The Project BLAST team would like to thank Frazer-Nash (Midhurst) Ltd. for the use of their workshop and machines. 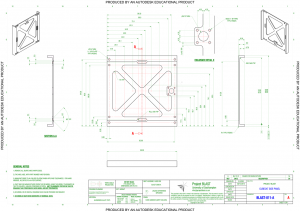 This article was posted in Technical Corner and tagged cubesat, drawings, manufacture. Bookmark the permalink. Follow comments with the RSS feed for this post.Post a Comment or leave a trackback: Trackback URL.